Polali Rajarajeshwari Temple, popularly known as Polali Temple, is located at Polali, around 22 km from Mangalore in Karnataka. The temple is dedicated to Mother Goddess Shakti who is worshipped here in the Rajarajeshwari form. The murti worshipped in the temple is believed to be more than 5000 years old. Legend has it that there lived a king named King Suratha. He was driven out of his kingdom by his corrupt ministers and a neighboring king. The king once roaming through the forest met a trader named Samadhi. They both then visited a Rishi who advised them to worship Mother Goddess Shakti. King Suratha and Merchant Samadhi made Murti of Mother Goddess Shakti and subordinate deities at Polali and started worshiping the Goddess. After long intense penance, Goddess appeared before the king and the merchant. The king asked for the return of his kingdom and it was granted. Merchant Samadhi asked for self realization and it was also granted. King Suratha then defeated his enemies and won back his kingdom. 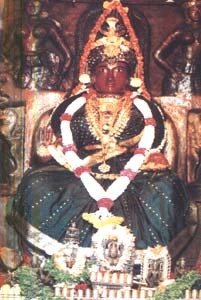 King then constructed a temple at Polali and placed his crown on the murti of the Goddess, who came to be known as Rajarajeshwari. The temple is located at the picturesque village of Polali, surrounded by paddy fields and hillocks. The River phalguni flows near the temple. Polali Rajarajeshwari temple is to be approached by a deviation road (BC Road around 10 km away from the temple) from the Bangalore-Mangalore (NH-48) road.